Bharati Ghosh (centre) with BJP leaders in Delhi on Monday. 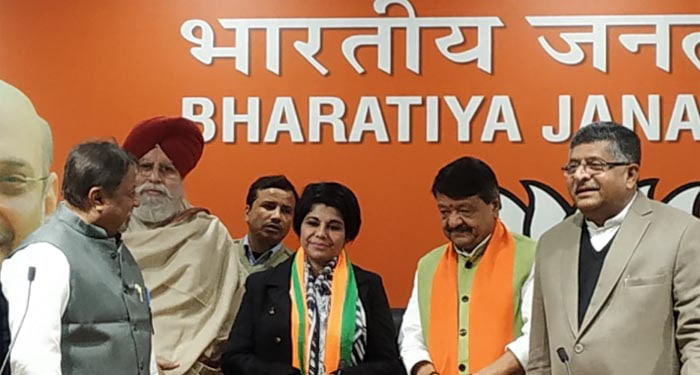 Kolkata: Bharati Ghosh, a former IPS officer who used to refer Chief Minister Mamata Banerjee as Maa (mother) but fell out with her in 2017, today joined the BJP. Ghosh, 55, against whom the Bengal CID has filed charge-sheet for alleged extortion, joined the saffron party at its national headquarters in Delhi today. Union law minister Ravi Shankar Prasad, IT minister SS Ahluwalia and, BJP Bengal observer Kailash Vijayvargiya were present on the occasion. Trinamool-turned-BJP leader Mukul Roy, maintaining contact with whom reportedly created the rift between Ghosh and the Bengal CM, was also present. Moments after joining the BJP, Ghosh launched a scathing attack on the CM and Kolkata Police commissioner Rajeev Kumar, to shield whom from CBI Banerjee is now on an indefinite dharna in Kolkata. CBI has accused Kumar of interference and destruction of evidence in the chit-fund scam probe. “This is not a Satyagraha. This is Osatyagraha (crusade for falsehood). Why the Chief Minister didn’t launch a Satyagraha when lakhs and lakhs of people were duped by chit-fund companies?” she asked. Asked by reporters as to how come her opinion changed drastically about someone whom she termed people’s mother, the former IPS officer said that it was the CM’s attempts at muzzling even the slightest dissent is what changed her stance. Ghosh, who herself was removed as West Midnapore police super for her alleged bias towards Trinamool during the 2016 Bengal Assembly polls, accused Rajeev Kumar of working for the Trinamool. “How come the police commissioner sat in the dharna with the CM? Doesn’t it indicate that he is working at the behest of a political party?” she asked. In December 2017, Ghosh was transferred by the state government as the commandant of 3rd Battalion of State Armed Police at Barrackpore amid reports that she was keeping contact with Mukul Roy who had switched over from Trinamool to BJP. 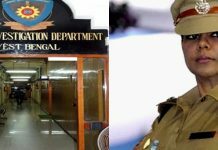 Peeved at the transfer, Ghosh resigned as an IPS officer and took voluntary retirement from service. A few days later, Bengal CID started a probe against her for alleged extortion from some traders in West Midnapore in the aftermath of demonetisation in 2016. 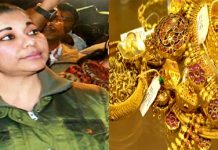 Even as Ghosh went absconding, CID raided her flats in Kolkata and recovered a huge amount of cash and gold ornaments that were said to be unaccounted for. CID even arrested her husband MAV Raju. Being on the run, Ghosh then moved the Supreme Court, which has granted an interim stay on her arrest. Today, the former IPS officer has begun a new chapter by joining active politics.